← The Alive with Clive Top 20: Latest Rankings! In case you didn’t know, I love music videos! In 2004, during an exercise in a course I was taking, I was repeatedly asked the question: “What do you love about your life?” In answering the question over and over again, I realized that I love waking up on a Saturday morning to watch VH1 Top 20 videos. In retrospect, my love for music videos – more specifically, the creativity, the self-expression and the music in them – has led me to create Alive with Clive the way it is today and interview so many singer/songwriters. Over the past several months, I’ve been noticing that more and more independent emerging and established singer/songwriters have been releasing music videos – a trend I find most heartening! To make it easier for you to see and appreciate existing and future music videos released by singer/songwriters who’ve been interviewed on Alive with Clive, I’ve decided to dedicate a Page here on my Blog to create The Alive with Clive Top 20 Music Videos Chart to run in conjunction with voting for The Alive with Clive Top 20. The Press Release announcing the launch of the new Alive with Clive Top 20 Music Videos Chart under the headline, “Cassandra Kubinski, A Star of The Alive with Clive Top 20, Inspires Creation Of New Music Videos Chart!” will be published soon. For this Chart, a music video from a singer/songwriter with the highest number of votes to be in The Alive with Clive Top 20 will rank at the top of this Chart, and music videos of singer/songwriters with fewer votes will be ranked accordingly. Since Irena Hart is in the # 2 position in The Alive with Clive Top 20, and has released a music video for “Heartstrings,” the title track from her CD, Heartstrings, her video will start out at the top of The Alive with Clive Top 20 Music Videos Chart, and will remain there for as long as she has the most votes out of all other singer/songwriters with a video to be in The Alive with Clive Top 20. Because the two charts, The Alive with Clive Top 20 Chart and The Alive with Clive Top 20 Music Videos Chart, will be correlated with one another, a singer/songwriter who wants his or her music video to move to the top of The Alive with Clive Top 20 Music Videos Chart to attract more attention can cause that to happen by obtaining more votes to be in The Alive with Clive Top 20. 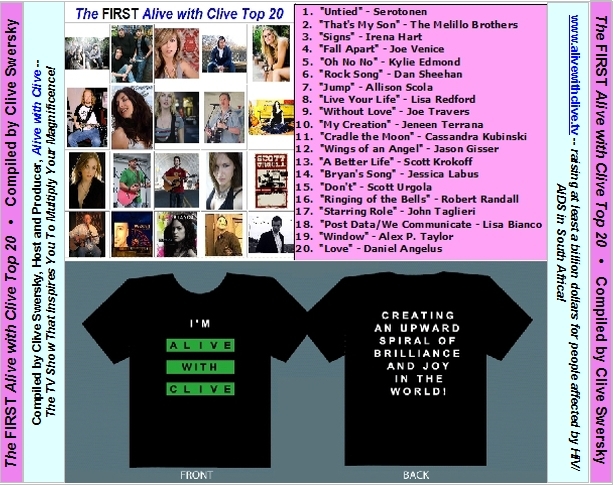 In addition, when music fans see the videos on The Alive with Clive Top 20 Music Videos Chart, they will be encouraged and reminded to vote for the singer/songwriter they like to stay at or move to the top of The Alive with Clive Top 20 Chart. As a result of the creation of this new Chart, singer/songwriters who have released or who do release music videos will receive a boost in their campaigns to obtain votes to be in The Alive with Clive Top 20 and benefit from being included in Alive with Clive Top 20 compilations that are created from now on. To date, while The FIRST Alive with Clive Top 20 compilation has been released and is available for purchase, the date has not yet been set for the release of The SECOND Alive with Clive Top 20. So there is ample time for singer/songwriters who are not yet in The Alive with Clive Top 20 to generate the votes to make it into The Alive with Clive Top 20 if they are not already there, or to move higher to solidify their positions in The Alive with Clive Top 20 to ensure inclusion in the The SECOND Alive with Clive Top 20 compilation. To discover how you can obtain one of the remaining exclusive signed and numbered physical copies of the The FIRST Alive with Clive Top 20 compilation of songs (while supplies last) after you become a Bronze Member of The Alive with Clive Global Community, FREE, click here. 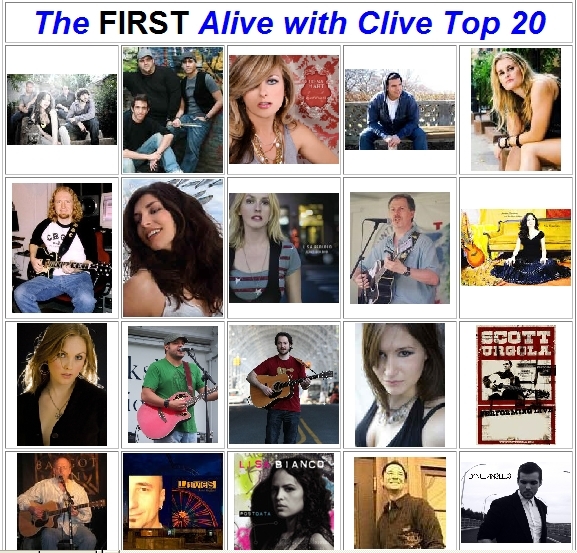 In its current form, The Alive with Clive Top 20 Music Videos Chart features twenty music videos that have been created by those singer/songwriters out of the 129 who have been interviewed on Alive with Clive who have released music videos. In the early days of its existence, it’s possible that more than twenty music videos will be featured on this Chart, but I anticipate that over time, as more videos are produced by singer/songwriters who have been interviewed on Alive with Clive, only the Top 20 will be featured. And where a singer/songwriter has released more than one video, in all likelihood the one with the most views on YouTube will be featured. To see the brand new Alive with Clive Top 20 Music Videos Chart, click here! This entry was posted in Alive with Clive Top 20 and tagged "Just Being Myself", "Windblown Girl", Alive with Clive, Alive with Clive Top 20 Music Videos, Alive with Clive Top 20 Music Videos Chart, Bronze Member, Cassandra Kubinski, Heartstrings, indepedent singer/songwriters, Irena Hart, Marvin Gaye, music videos, Sexual Healing, singer/songwriter, singer/songwriters, Textual Healing, The Alive with Clive Global Community, The Alive with Clive Top 20, The FIRST Alive with Clive Top 20, The SECOND Alive with Clive Top 20, trend, VH! Top 20 Videos, YouTube. Bookmark the permalink. 1 Response to Announcing: The Alive with Clive Top 20 Music Videos!